Although not a new device, the LM317 is still a high-performance regulator. Its output voltage is essentially immune to fluctuations in load, supply voltage and temperature and this makes it ideal as the central element in a float charger for NiMH cells. Float charging has the advantage of keeping the cells fully charged and ready to use without the potential damage of long-term trickle charging or the cost of low-discharge cells. This works because NiMH cells do not have the memory problems associated with Nicads. The circuit is based on a conventional LM317 regulator. Resistors R2 & R3 and trimpot VR1 set the maximum output voltage to between 1.3V and 1.4V per cell. VR1 should be adjusted for a value of 1.35V per cell at the regulator output. Resistor R2 has been fixed at 240O. The formula for the voltage output is: Vout = 1.25*(1 + (R3 + VR1)/R2). 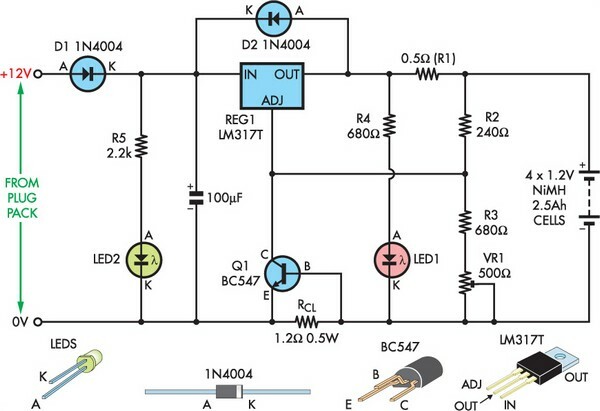 Diode D1 protects the circuit against reverse polarity of the power supply and protects the LM317 should the power be disconnected while it is still connected to a charged battery pack. Resistor RCL and transistor Q1 limit the maximum current in the event of a short circuit or the connection of a severely discharged battery pack. 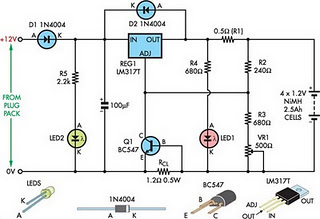 LED2 provides an indication of voltage input to the charger. LED1 and the 680O resistor provide the same function for the charger output and also provide a minimum load for the regulator when the battery pack is nearing full charge. This is necessary to keep the regulator output from drifting up and damaging the batteries. The circuit uses an external DC plugpack and is suitable for four NiMH cells rated at 2.5Ah. 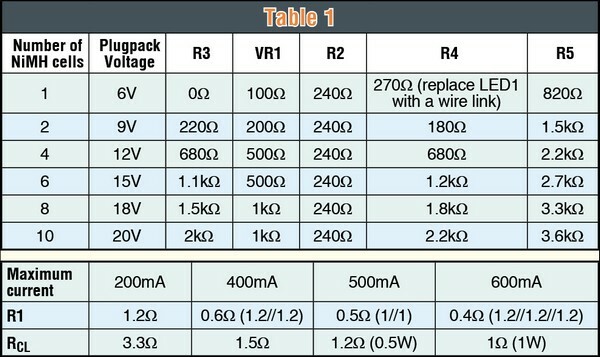 Table 1 gives alternative values for 1-10 batteries in series at peak charge currents of between 200mA to 600mA. If you are using the specified plug-pack and the TO-220 packaged LM317T, you will need a heatsink rated at 12°C/W or better for any design other than the 200mA single cell charger. A TO-3 packaged device with the correct plug-pack will be OK without a heat-sink for any of the 200mA configurations and up to four cells charging at 400mA.